Handmade furniture tells a story. Your story. (And that includes the dent where someone accidentally dropped a mug on the coffee table.) 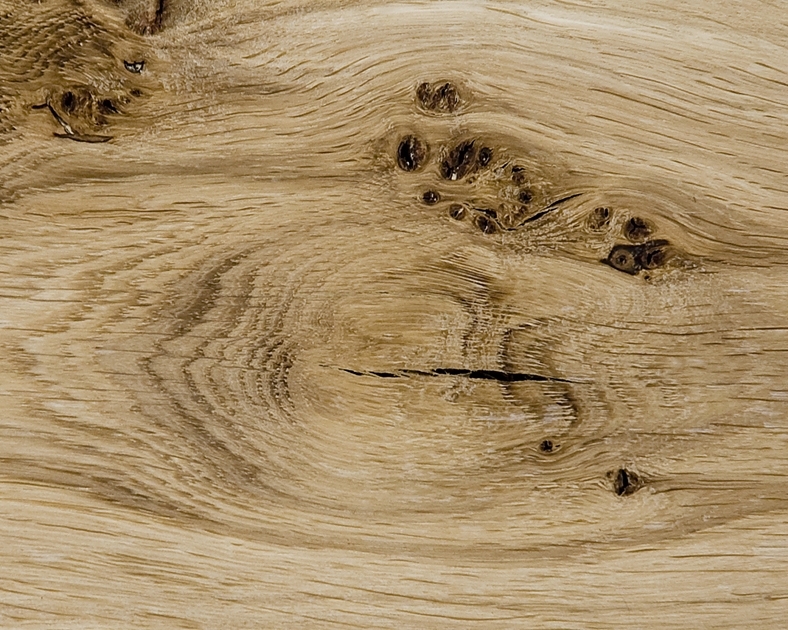 Just like people, hardwoods have character. The colour, the grain, the shape and the texture of each board is unique. The one-off patterns and irregular edges missing from mass produced furniture are the features that work so well in my furniture making. Furniture made from native hardwoods should catch your eye, capture your imagination and become an old friend, offering years of companionship. I like to work with locally sourced native species of wood with ash, beech, elm, oak, birch, sycamore and yew all making regular appearances. Scotland is home to some incredible native hardwoods which offer a wide range of colours, textures and characteristics to work with. A keepsake box made from sycamore with a spalted beech lid and fumed oak handle. There are a rich palette of tones, textures and character available in native wood. Ash is a popular wood with a pronounced coarse grain pattern. The sapwood ranges from creamy white to pale tan in colour and occasionally it has a pinkish hue, while the heartwood is light to chocolate brown in colour. ‘Olive ash’ is a general term used to describe examples where there is a lot of darker heartwood present - it is not a separate species. Other unusual grain patterns include rippled and marbled ash. These occur most frequently in older trees, where the grain has grown in wild patterns. When dried, ash is one of the hardest native species available in the UK. Historically it was used for tool handles and frame machinery. Ash is one of my favourite woods to use as it is fairly easy to work; it planes and sands well; and it takes a high sheen finish. The tonal difference between heart and sapwood makes it a striking choice for book-matched door panels and feature board table tops. Birch is a uniform wood with a straight grain and fine texture, although Scottish birch tends to have more wild grain. It is creamy white to light tan in colour, often with a slight golden or pink hue. Darker flecks are often found in the grain, which can be quite pronounced. Variations of grain include pippy birch, which features small pin knots in clusters, and marbled birch, where the grain has grown in wild swirls and quilts. Birch is often undervalued and overlooked for bespoke furniture due to its association with cheap Scandinavian flatpack furniture. It can be quite difficult to work with the grain frequently tearing out when planed and it is also prone to splitting along the grain. However it’s an interesting wood which sands well and can be finished to a high sheen - marbled birch is particularly attractive. i. Quercus sessiliflora or petraeaii. Quercus robur/pendunculata. 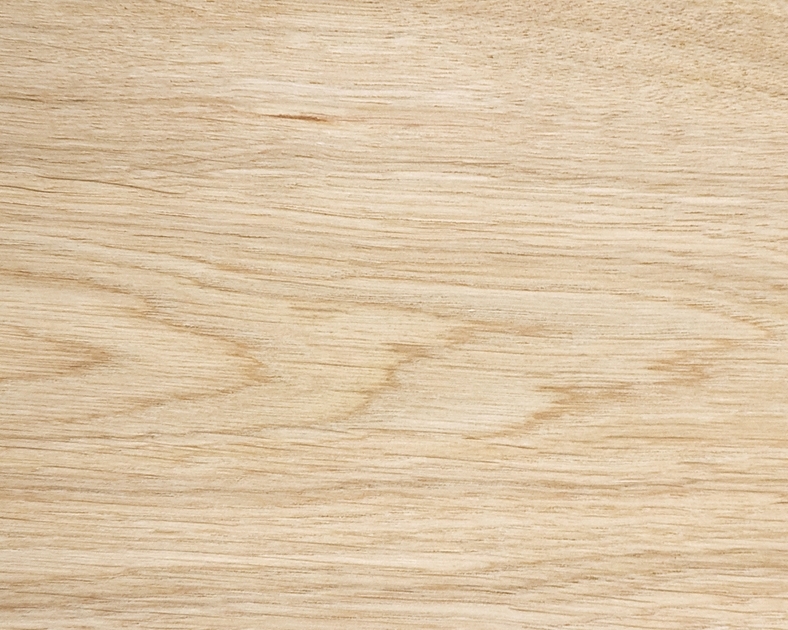 A firm traditional favourite, oak is generally straight grained with a course texture. Native oak tends to be less straight and more characterful than European oak - partly due to growing conditions and forestry practises. Oak tends to have a uniform coloration, ranging from light tan to medium brown. When cut 'quarter sawn', the surface of the wood shows the attractive silvery figure of the medullary rays inherent in oak. Pippy and burr oak are common characteristics of native oak and can vary from light to heavy coverage. 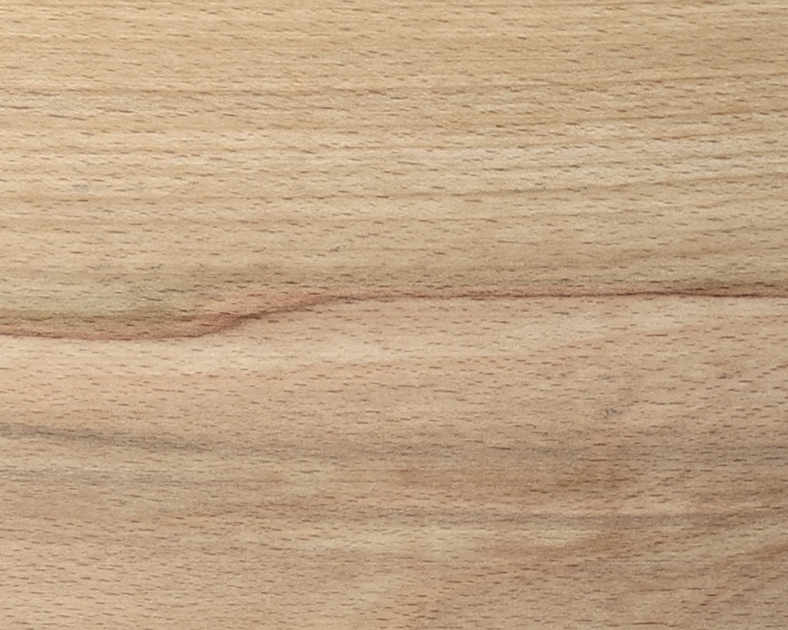 Rustic oak is a catch-all term to describe wood with lots of knots, splits and wild grain - these defects give real character to the wood and when used correctly can look stunning. Brown and tiger oak refer to wood that has been attacked by beefsteak fungus, which causes the wood to turn a darker brown. 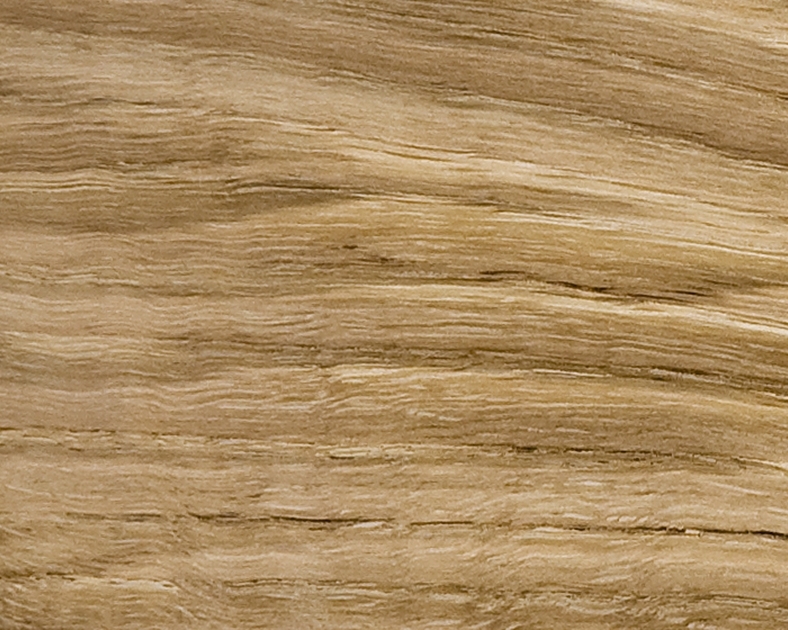 The darkest oak is fumed oak which is produced by fuming the wood with ammonia. The ammonia reacts with the tannin in oak and turns the wood a dark chocolate brown colour. Oak is a traditional timber that everyone is familiar with and it sits in the middle of the native wood colour spectrum. Is is darker than birch and sycamore, but lighter that elm and fumed oak. Due to its familiarity it’s sometimes regarded as being a bit ‘safe’, but the variety of grades and characteristics available in native oak ensure that it is never a boring choice. Oak is a good timber to work with although it is prone to splitting and surface checking. Yew isn’t actually a hardwood but it deserves to be mentioned due to its popularity and distinctive qualities. 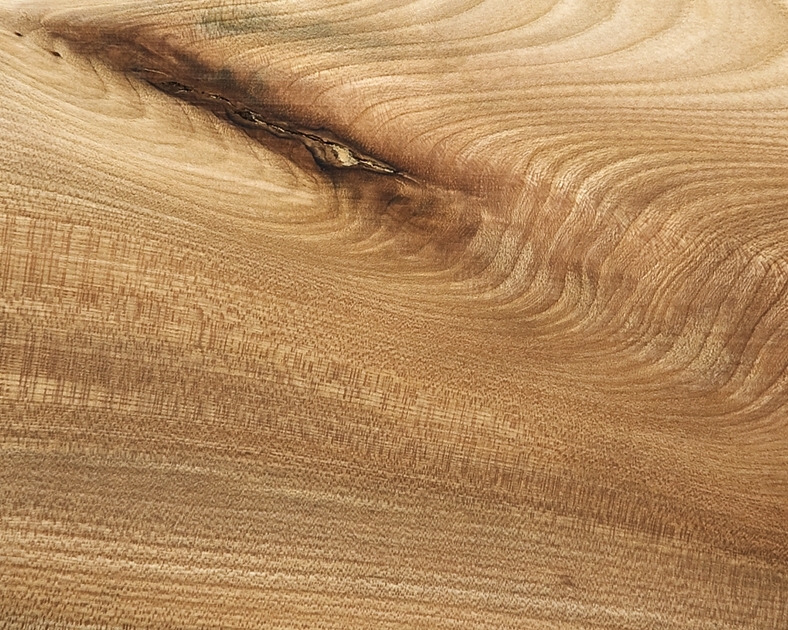 Yew wood can be straight grained although more commonly it is curly and irregular with lots of live and dead knots. The heartwood is golden orange-brown with streaks of purple/dark brown veins. The sapwood is creamy white and contrasts nicely with the heartwood. Clusters of pin knots are usually present adding a further visual interest to the wood. Yew is a challenging wood to work with as it is very prone to splitting and it frequently tears out when planed. But it is easily sanded and finishes to a very smooth sheen. Yew isn’t readily available in wide boards or large quantities, so it is most often used for decoration and wood turning. Beech is pale cream to pink/brown in colour, often with darker coloured veining. Close grained with a straight, fine and even texture, it doesn't splinter in use and as a result it frequently is used for chopping boards and cooking utensils. Variations include flamed beech - where the darker veining is more pronounced, and spalted beech - the result of fungus growing through the log which gives a random pattern of black veining and irregular colour patterns. Once dried, the fungus is inert, although from a furniture-makers point of view care needs to be taken when sanding to avoid inhaling spores. 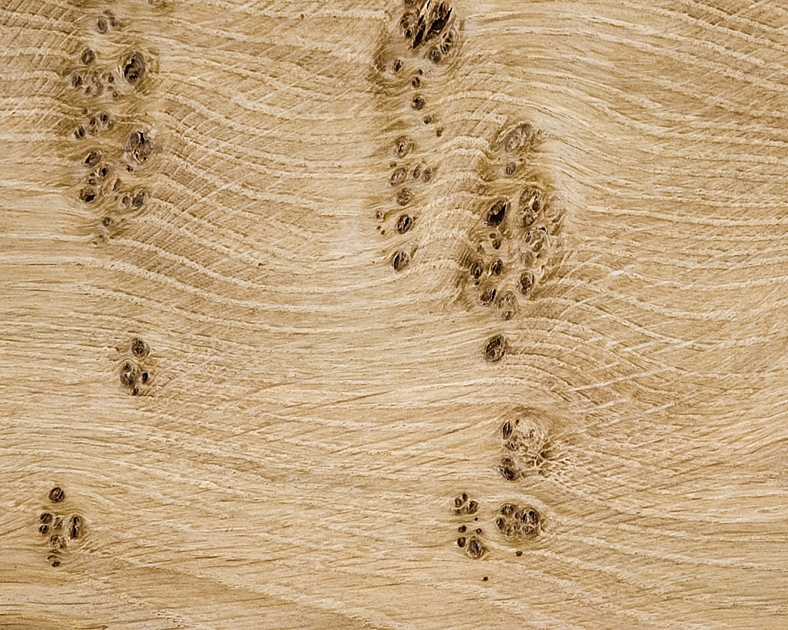 Although attractive, spalted beech isn't particularly strong, so care needs to be taken when selecting wood. Beech is a strong and relatively heavy wood that is good to work with and finishes well. The pinkish hue is not to everyone's taste but spalted and flamed beech are popular. It has a tendency to move a lot with seasonal variations in temperature and humidity, sometimes dismissively being referred to as 'bendy beech'. With careful selection and good design this movement can easily be accommodated. Elm is a very popular wood thanks to the irregular grain pattern and course texture which give it loads of character. 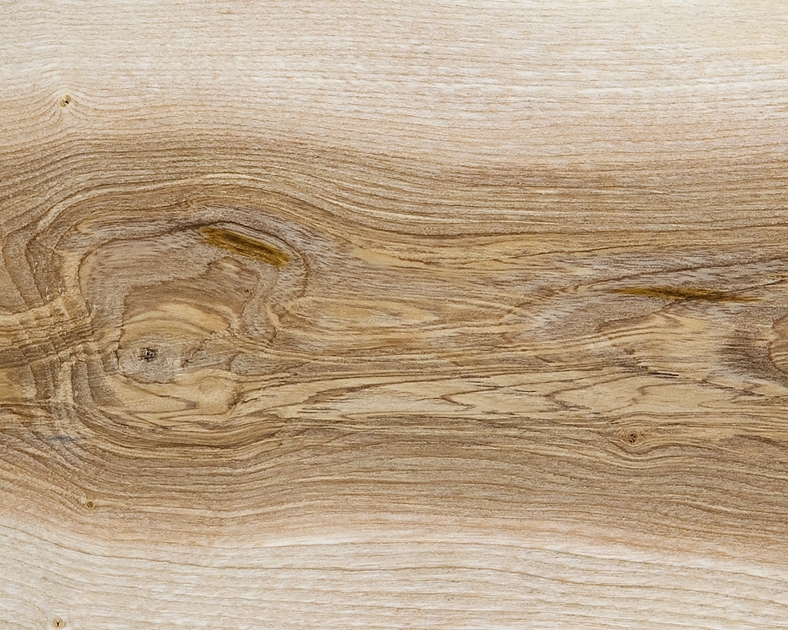 Wych elm is generally straighter grained and often has a distinctive green streak running along the grain, while English and Dutch elm grow more irregularly with a more complex grain pattern. The heartwood generally has a warm hue that is mid to dark brown with a red tone, while the sapwood is a lighter tan colour. Due to Dutch Elm Disease, most elm comes from standing deadwood trees - trees that have been killed by the disease but which have not fallen. The coloration tends to be darker in dead trees as there is no living sapwood. Burr and pippy elm describe the pin knots and larger burrs found in the wood. This can vary from light 'cats paws' to dense areas of heavy burr. Elm is best described as a very 'woody' wood that can be quite hard to work. The grain, colour and texture combine to give a wood with immense character that is highly prized. 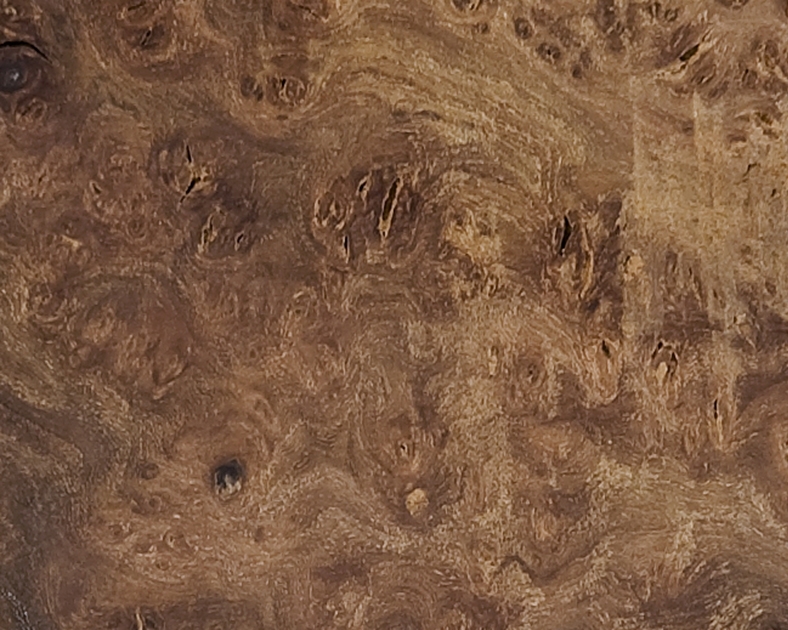 Burr elm in particular is much sought-after and due to Dutch Elm Disease it is relatively hard to source. As a result prices are getting high for good quality timber with the best logs frequently being exported abroad. Sycamore is a straight grained and uniform wood with a fine texture. It is creamy white to light tan in colour, often with a green flash similar to elm. The heartwood can be darker in colour - almost orange or brown. Marbling and flaming colour variations are often found, similar to those in beech. Quarter sawn boards have an attractive lacey figure that is highly prized. 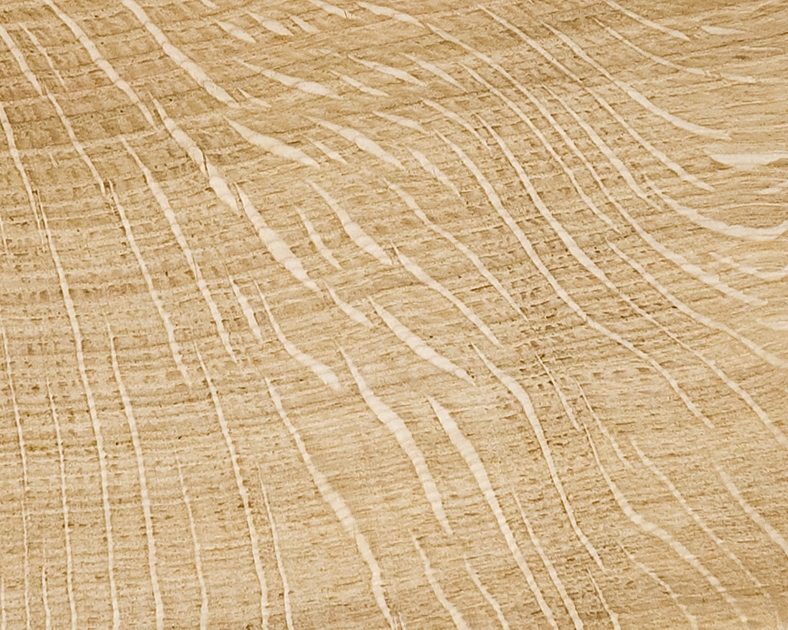 Ripple sycamore is a highly figured wood that has an undulating grain pattern that reflects light giving a ripple effect. Thanks to this striking appearance it is often used in musical instrument making and high end furniture. Other variations include pippy and burr sycamore and on occasion light spalting similar to beech can be found. Sycamore is a beautiful wood that is easy to work and it finishes to a natural lustre that is buttery smooth - very similar to maple. It’s a personal favourite that deserves to be more popular than it currently is in the UK.